APT Capacity Building Programme has been hailed as the APT’s most successful and reputed programme to date. It has provided direct benefits to member countries in different areas of expertise and endeavours. Training is provided in the areas of ICT, Telecommunication Management, Mobile Communication, Multimedia, Telecommunications and ICT Policy and Regulation, Broadband Technologies, IP Services, Rural Telecommunication Techniques, Network Security, Customer Relations and on other topics as identified by members. Over the period from its commencement in 1980 to 2015, APT has awarded a total of more than 8,600 fellowships under its training and fellowship programmes providing its members an access to quality human capacity building activities and development programmes. 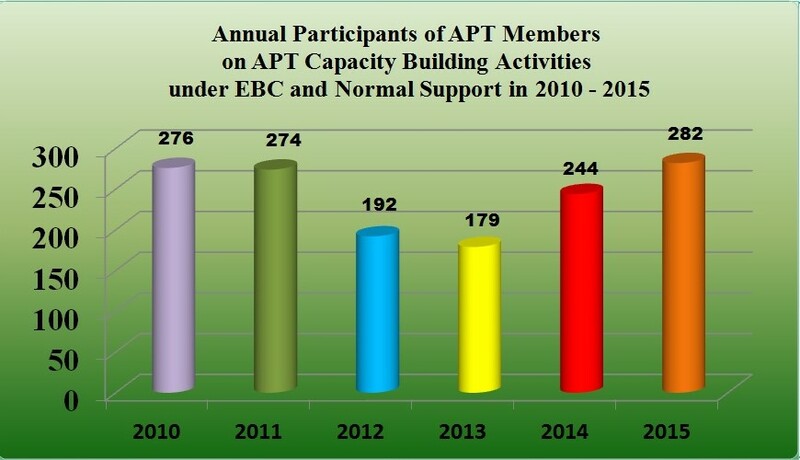 Through the sustained support from the voluntary contributions of its members, including the Affiliates members, coupled with active partnership with the regions’ training centers, the training courses offered by APT have had record numbers of trainees/participants in recent years. APT Capacity Building Programme is composed of the following components. Training Courses are mainly composed of lectures and hands on activities, and usually making use of the facilities and resources offered by APT Member countries. Topics or fields are selected based on the requests from APT Member countries and the latest development and demands in ICT sector. Trainees are selected from nominations from APT Member countries. APT Expert Mission is an APT initiative to provide expert assistance to member countries to meet their specific needs. The Expert Mission is designed to enhance the human resource development in ICT area based on the Brunei Darussalam Statement of the Asia-Pacific ICT Ministers in 2014. Therefore, APT is promoting the Expert Mission along with the training courses under APT Capacity Building Program. Study visits are mainly composed of technical visits to the facilities in APT Member countries. Topics or fields are selected based on the requests from APT Member countries and the latest development and demands in ICT sector. Participants are selected from nominations from APT Member countries. Workshops, Seminars and Symposia are held with the view to capacity building in APT developing Member countries in ICT and other related sectors. Topics are selected based on the requests from APT Members and the needs of the host countries. Training Course on Preparing for International Conferences, March 28-31, 2016, APT Headquarters, Bangkok, Thailand.